More people than ever are accessing higher education, but how does the rise in student numbers vary by region, qualification type, age group and ethnicity? Enrolments to higher education courses in the UK have increased in recent years, with 2,343,095 individuals in HE in 2017/18 compared with 2,299,460 in 2013/14. Demand for undergraduate courses has risen, with 1,776,540 students recorded in 2017/18 compared with 1,760,020 in 2013/14. However, this general upward trend was not evident across all areas of the UK. For example, Welsh institutions experienced a slight fall in registrations in 2017/18 compared with the previous year. This appears to have been particularly affected by a 6.4% fall in part-time study, as the full-time figure actually increased by 1.2%. A similar pattern is evident in Northern Ireland, with declining year-on-year enrolments over this five-year period caused by a 13.4% drop in part-time study. In fact, part-time study has fallen in the UK generally, but in Wales and Northern Ireland the growth in full-time study hasn't outweighed the decline in part-time study. 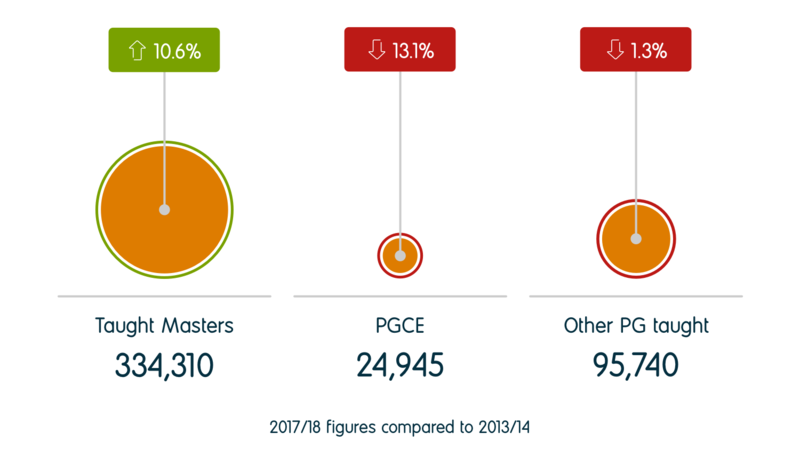 A breakdown by qualification type reveals that the rise in undergraduate enrolments at UK institutions was driven entirely by first-degree courses, which increased from 1,533,950 in 2013/14 to 1,621,725 in 2017/18. 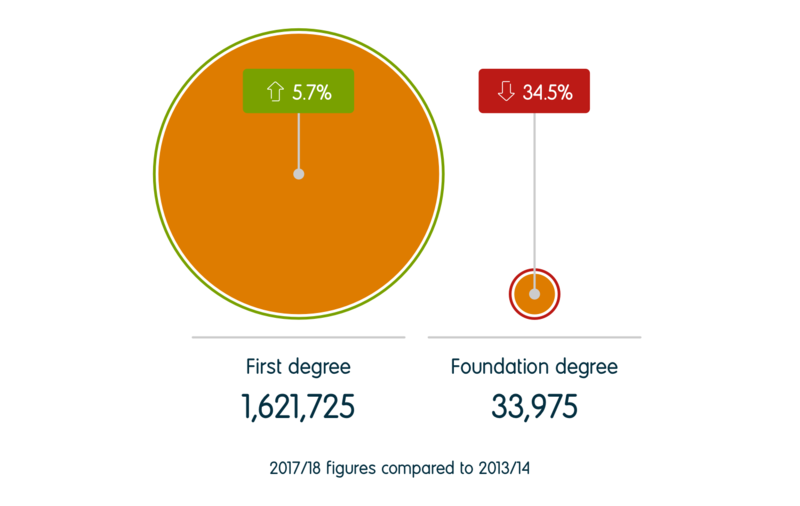 By contrast, registrations for foundation degrees were down 34.5%, other undergraduate study was down 31.9%, and Higher National Diplomas (HND) and Higher National Certificates (HNC) were down 14.6% since 2013/14. The overall picture for postgraduate research enrolments is generally one of declining numbers. Over the past five years registrations peaked in 2015/16 at 113,175 students, followed by falling numbers year-on-year. The latest figure (111,565) remains relatively unchanged to that in 2013/14 (111,570). This decline was led by falling 'other postgraduate research' numbers, as the number of Doctorate research enrolments has actually increased annually. 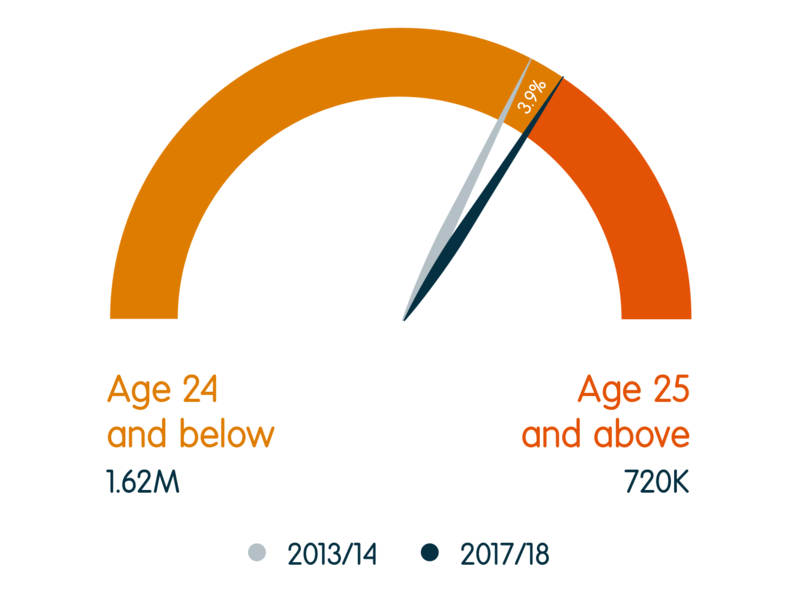 The aged 25 and over student cohort is shrinking, with 265,990 enrolments by those aged 25 to 29 in 2013/14 compared with 259,280 in 2017/18 (-2.5%). A large drop was evident in the number of students aged 30 and over, with 461,495 enrolments in 2017/18 compared with 530,410 enrolments in 2013/14 (-13%). In contrast, enrolments for those aged 20 and under have risen year-on-year for the past five years. Conversely, the figure for Black, Asian, Mixed and other ethnic backgrounds has increased by 18% over the past five years (436,995 students in 2017/18). 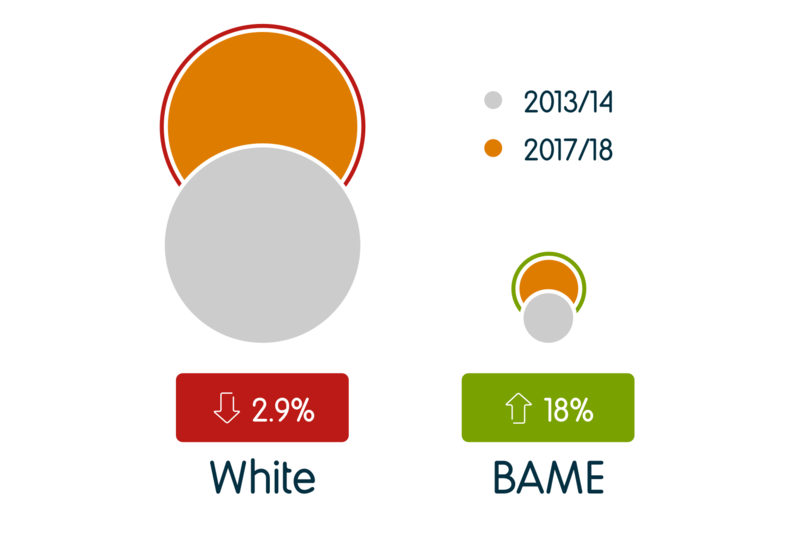 This rise could be a result of increasing measures to target BAME individuals as part of the university widening participation agenda. 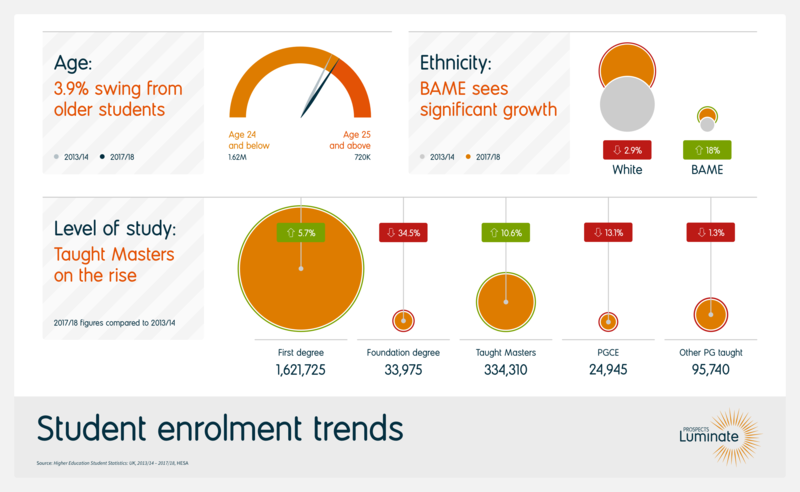 A briefing by the Office for Students noted that around a quarter of providers mentioned targeting BAME students in their 2017-18 access agreements and around 10% had long-term outreach activities with primary and secondary schools (14%) to encourage BME progression to higher education.6 It is likely that such actions have enabled institutions to create a more inclusive and diverse student cohort. Source: Higher Education Student Statistics: UK, 2017/18, HESA, 2019 and Higher Education Student Statistics: UK, 2013/14, HESA, 2015. Drop in teacher training recruits revealed, BBC, 2017; Burned out: why are so many teachers quitting or off sick with stress?, The Guardian, 2018. Applicants for UK higher education down: 5% for UK students and 7% for EU students, UCAS, 2017. Admissions patterns for mature applicants 2017 cycle, UCAS, 2018. 'Wasted potential' of mature students, BBC, 2018. Number of white people accepted at universities drops despite overall rise in UK students, Independent, 2018. Topic briefing: Black and minority ethnic (BME) students, Office for Students.